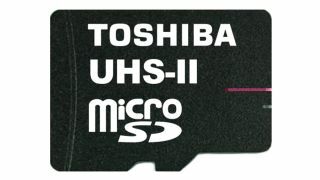 Toshiba has announced what it claims is the world's fastest microSD memory card range, with speeds of up to 260MB/s. The new series comes in 32GB and 64GB capacities. The 32GB model has a maximum read speed of 260MB/s and a maximum write speed of 240MB/s. The 64GB version has maximum read and writes speeds of 140MB/s and 130MB/s respectively. Compared to Toshiba's older 32GB UHS-I card, the read speed is 2.7 times faster, while the write speed is a whopping eight times faster. The new memory cards are UHS-II compliant and use an SD Memory Card Standard Ver. 420 serial bus interface. Toshiba has noted a trend towards higher resolution, and thus larger file size, photos and movies with newer smartphones and tablet computers, making the need for faster storage more essential than ever. The company will begin shipping samples to smartphone makers immediately. It plans to release more UHS-II microSD cards in the future as the mobile industry continues to boom. Storage wars: do we really need microSD cards in our phones?